If anyone loves recipes, it's us. But we're all for breaking the rules and making a meal your own, too. Especially when it comes to veggie burgers! Select a base. Add your binder. And season away. something that you try to convince people tastes just like meat! No, a veggie burger is just a really nice way to serve a vegetarian a bunch of beans -- so they can grow big and strong -- snuggled inside a soft bun. Or atop a salad. A veggie burger is a way to play with whatever spices are making you excited this week, add in some scraps from your fridge, and then form it all into something that can sit in the middle of your plate when you’ve tired of eating quinoa salad or grilled tofu or, say, cereal eaten from the box for dinner. They freeze well, and are therefore a way to protect your future self from dinner monotony. They will breathe new life into the five quarts of chickpeas you've dutifully been eating through all week. Veggie burgers are easy to make. You need a sturdy base -- I like beans and some sort of grain, like cooked brown rice -- plus binders and seasoning. I use eggs as a binder, but if you’re vegan, you can just omit it -- according to Gena, a replacement isn’t usually necessary. Here’s how I make my veggie burgers -- they are not always perfect, but they are far and away better than what you’ll find in the freezer aisle, and are excellent both baked and pan-fried. 1. Gather your ingredients. I usually rely on a can of beans -- but you can measure out 2 cups of cooked-from-scratch beans if you have them. For every 2 cups, you’ll want one egg (or not, if you’re vegan), and 1/2 cup of breadcrumbs or oats, which are hiding from the photo above. I also like to use about half a cup of cooked grains, like sturdy brown rice or farro. Then go crazy with the other stuff: I always include a bunch of chopped alliums (here, a large shallot) and spices (smoked paprika and cumin). 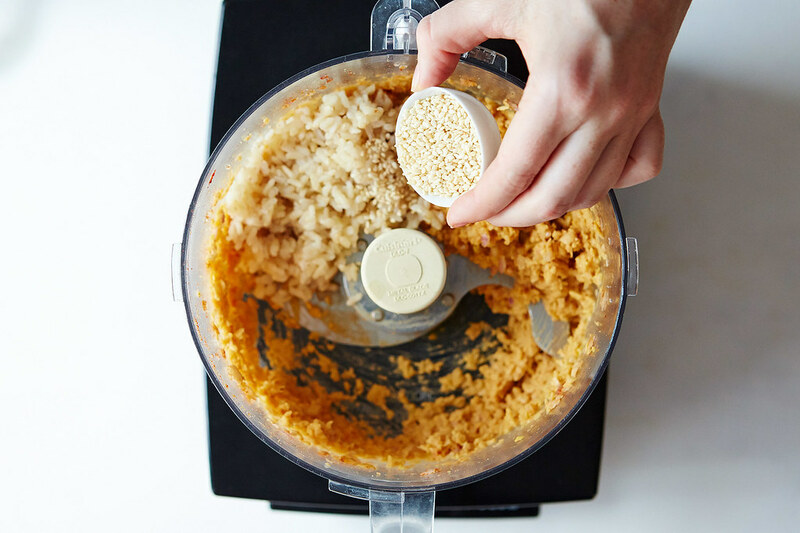 I added tahini and sesame seeds, too -- but you can use walnuts, or other nut butters, or sturdy herbs like oregano and rosemary (more delicate ones, like parsley, get lost). 2. 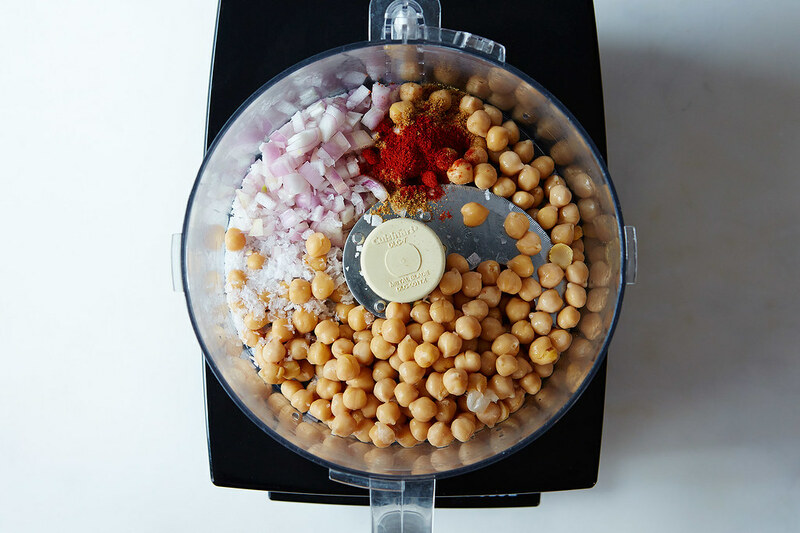 In a food processor, pulse your beans, alliums, and spices until they make a coarse mixture — you want to get your alliums in small pieces and start breaking down your beans before you add your liquids and binders. 3. 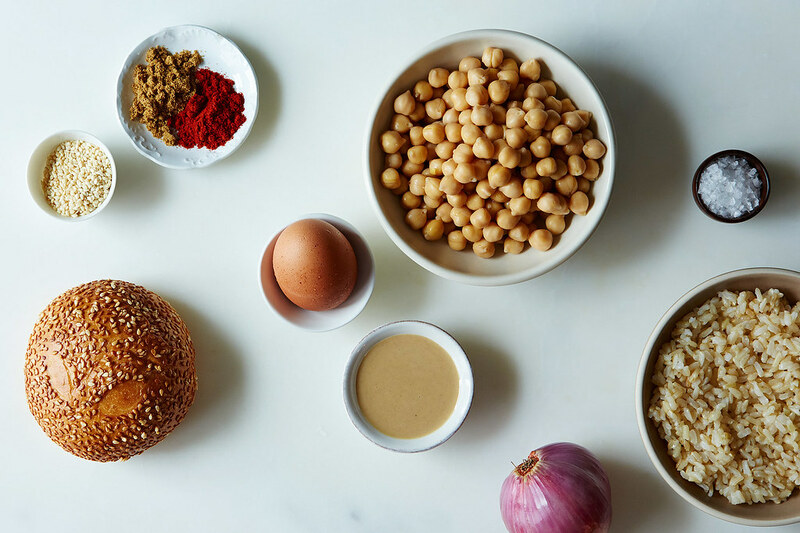 Add your egg if you’re using it, plus other “wet” ingredients -- like tahini -- and pulse a few times. If you’re using cooked grains or seeds, both of which I did here, pulse them in just until they’re integrated into the mixture -- you don’t want your rice to get gummy. This is also where I should have included half a cup of breadcrumbs. I didn’t, then tried unsuccessfully to fry my first burger, which crumbled. Our test kitchen manager Allison saved the day, calming me down and mixing in some crumbs, which turned my patties from "just holding together at the seams" to "stable and fry-able." 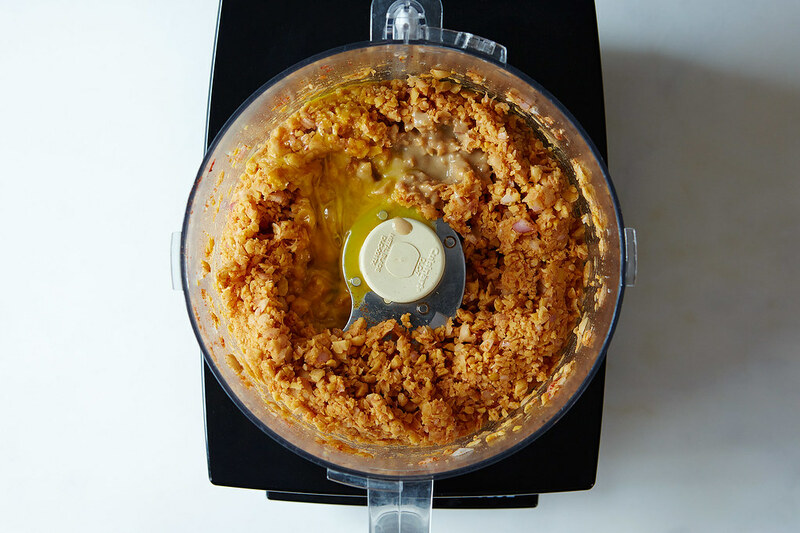 You can use breadcrumbs and ground-up oats interchangeably, but I prefer the former. 4. Form your burgers into patties -- one can of beans will get you four to five burgers, depending on size -- and place them on a parchment-lined baking sheet. Keep in mind the size of your buns when you're forming them, so the burgers don't dwarf their vessels, or hide inside of them. Note: If you're going to pan-fry your burgers, fry off a tiny little test patty -- this will help you to be sure that your burgers won't crumble, and will give you a better sense of their flavor, without having to eat raw eggs (or alliums). 5. Fry or bake your burgers. I like to pan-fry, because it will consistently give you a better flavor and better texture (thank you, Maillard reaction! ), and there's less risk of drying them out. 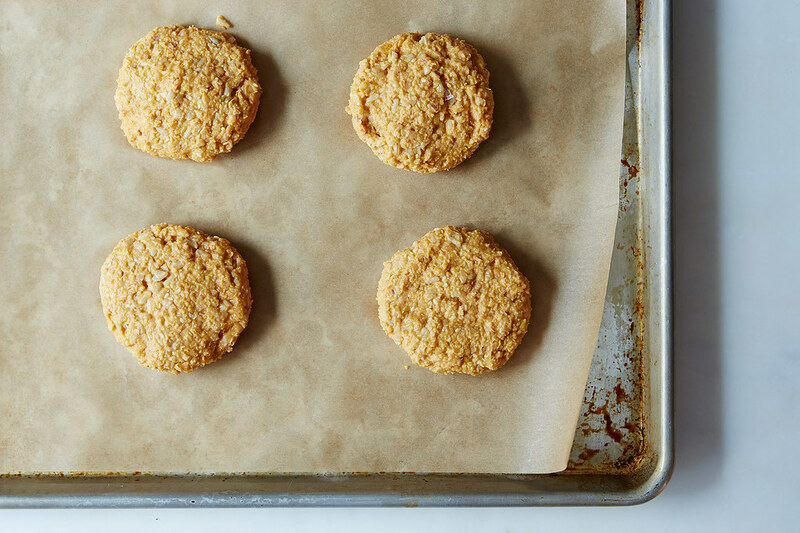 If they're delicate, though, baking can be a better bet, because you won't risk them breaking when you flip 'em. 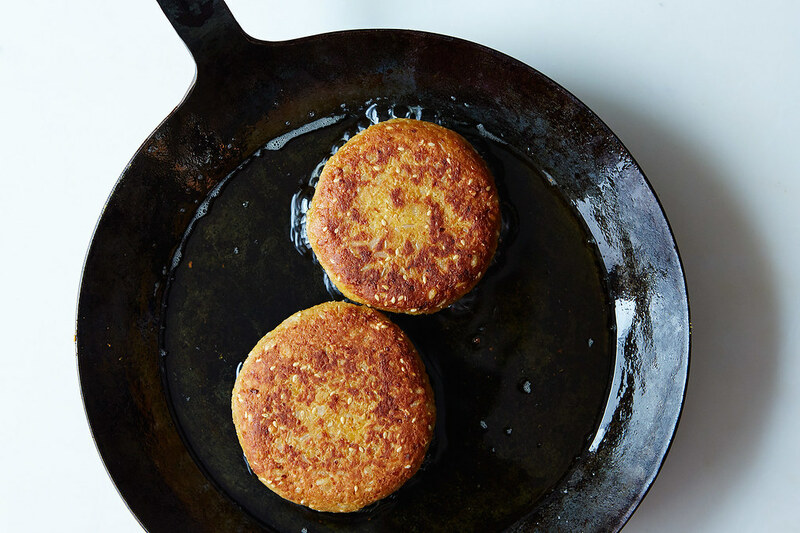 If you choose to fry, heat a skillet over medium-high heat and get yourself a good layer of olive oil in there -- you want more than a "thin coating." Fry them until the bottoms are brown and you're confident in your ability to flip, about 5 minutes. The other side should take just as long. If you choose to bake, do so in a 350° F oven for 30 to 35 minutes. 6. Serve them up with great fanfare! I like fried burgers on an untoasted bun; the squish and crisp contrast nicely. Add whatever condiments you like, but I suggest something nontraditional like spiced labneh (what I used here), or even pesto, or aioli. Ketchup will work for, say, a smoky black bean burger, but if your patty is nontraditional, your condiments should be allowed the same liberties. Lettuce, as always, is a good choice. Tomatoes, when in season. Pickled red onions. Lay it all on there. 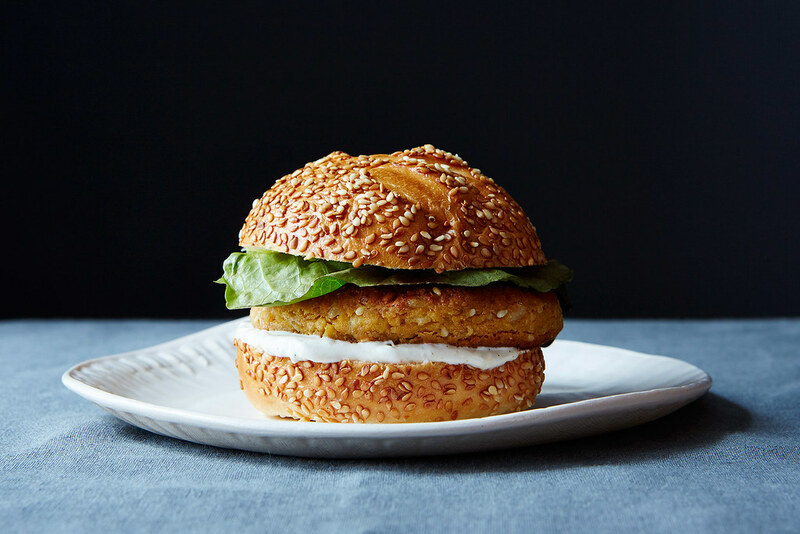 And then, if your veggie burger happens to look like a fish filet sandwich, make lots of jokes about it before taking your first bite. And then your second. And then your third and fourth and so on, in rapid succession, until your plate is just crumbs and swipes of condiments and joy. This article was written by Marian Bull from Food52 and was legally licensed through the NewsCred publisher network.